Celebrate the release of the Halo 4 Majestic Map Pack with Playtime! Looks like Warren and Cobra have gotten the chance to spend some time on the new Majestic Maps. Take a look and see what they’re up to! The Halo 4 Majestic Map Pack will be released on February 25. Make sure you grab them! If you want to see more Playtime, you can visit the official home page, YouTube Channel, or Facebook page! And don’t forget to check out the new trailer for Playtime Season 4! 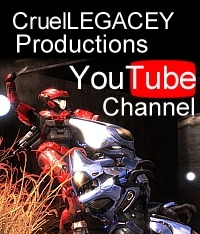 Video | This entry was posted in Episodes, Halo 4, Playtime, Video and tagged halo 4, machinima, majestic map pack, playtime. Bookmark the permalink.